This Endon Louvre 65cm outdoor pedestal post light in 304 stainless steel is rated IP44 and features a modern take on traditional style. Boasting a circular ground mount, 65cm tall stem and clear polycarbonate shade, with external louvres for a diffused light. Perfect for placing on gate posts, highlighting pathways, patios or any outside space. Now you can add traditional charm to your outdoor lighting with the Louvre collection. The traditional design is enhanced by an all stainless steel construction and horizontal louvres. Use with a standard light bulb or go for an LED lamp to save money and energy. Exterior fittings must have an IP (Ingress Protection) rating which indicates the fittings ability to prevent solids and liquids penetrating the enclosure. The higher the number, the greater the protection. The minimum rating for an outside light exposed to the weather is IP23. This external light is rated IP44. 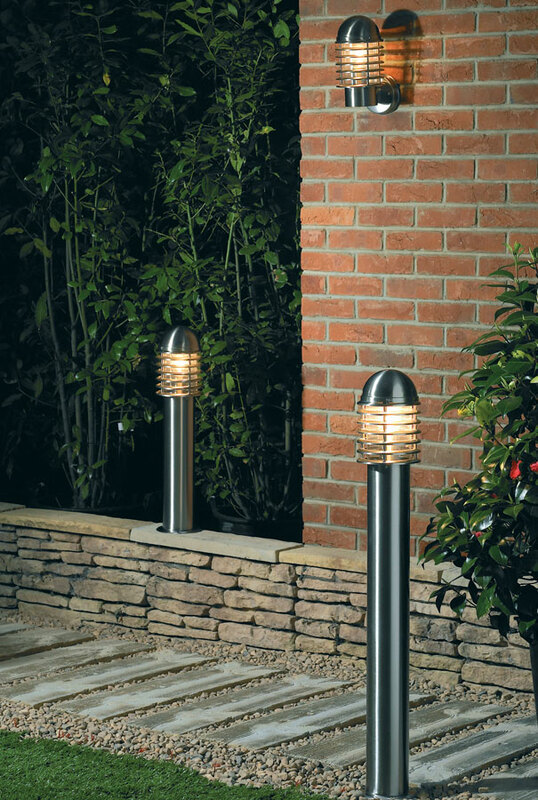 There are matching fittings in the stainless steel Louvre outdoor range that includes a bollard post light, wall light with PIR sensor and one without; please see below. This exterior light is Manufactured by Endon Lighting, a design led business who lead the way in style and innovation to create an impressive range of products such as the Louvre 65cm outdoor pedestal post light in 304 stainless steel and rated IP44 you see here.